GlycoMark® - Cleveland HeartLab, Inc.
Aliquot plasma into labeled transport tube labeled as “EDTA plasma” and cap tightly. Discard original tube. Transport: Store serum or EDTA plasma at 2°C to 8°C after collection and ship the same day per packaging instructions provided with the Cleveland HeartLab shipping box. Glycemic control goal for diabetic patients: >10 µg/mL. 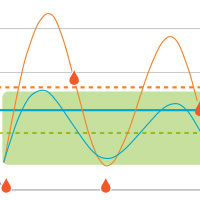 GlycoMark® reference ranges only apply to individuals without diabetes. Intended Use: The GlycoMark® test may be performed monthly on individuals with moderately controlled diabetes and HbA1c of 6-8% to detect glucose excursions, and to monitor efficacy of therapy changes in diabetic individuals with high HbA1c (>8%). The GlycoMark® test helps identify patients with more frequent and extreme hyperglycemic excursions over the previous 2 week time period, despite similar HbA1c levels, and indicates the need for more frequent self-blood glucose monitoring or continuous glucose monitoring. Approximately 40% of individuals with diabetes who are “controlled” for glucose and HbA1c testing have significant post-prandial glucose variablility1. In fact, the average blood glucose in an individual with an HbA1c of 7% can range from 123 to 185 mg/dL2. Low levels of 1,5-AG are associated with the presence of diabetes complications. For example, low circulating levels of 1,5-AG are associated with elevated levels of urinary albumin and N-acetylglucosaminidase, both markers of renal damage3. Bonora E et al. Prevalence and correlates of post-prandial hyperglycemia in a large sample of patients with type 2 diabetes. Diabetologia. 2006; 49: 846-854. Nathan DM et al. Translating the A1C assay into estimated average glucose values. Diabetes Care. 2008; 31: 1473-1478. Yamanouchi T et al. Relationship between serum 1,5-anhydroglucitol and urinary excretion of N-acetlyglucosaminidase and albumin determined at onset of NIDDM with 3-year follow-up. Diabetes Care. 1998; 21: 619-624.